This apple puzzle is very quick, simple and inexpensive to produce. Just three turned, wooden parts and a small, metal pin are needed to produce a puzzle that is intriguingly difficult to solve. It even looks attractive while it is sitting there waiting for inspiration to strike the puzzler. 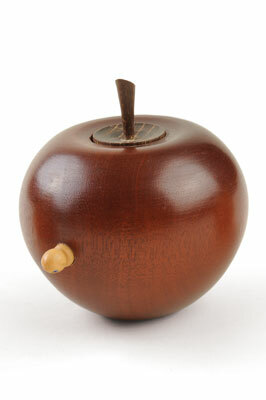 When well shaped and well turned, apples are most appealing objects. This apple, like many garden-grown apples, contains its own little visitor. The tiny, wriggling grub, peeping out of its hole, has begun its meal, but has it ruined the whole apple? Just remove the core to see if this apple is good or bad inside. 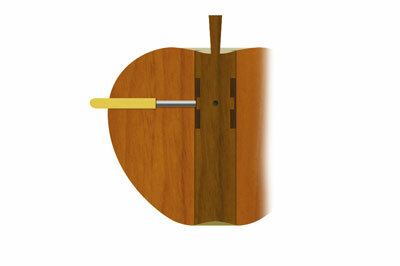 For the apple, I used some wonderful old mahogany cut from a large table leg I was given many years ago. As it moves and the light plays on its surface, this mahogany ranges in colour from a rich tawny red to a pale auburn brown. 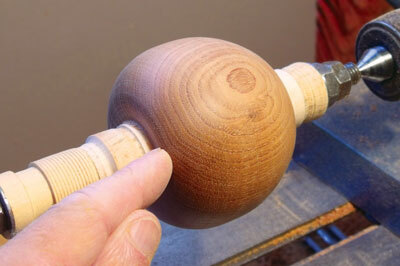 I first saw the laburnum from which I turned the core when it was being cut down in a front garden. The trunk was 45cm diameter, a magnificent piece. I spoke with the person removing the tree and he was only too pleased for me to take the trunk and any other usable pieces. Once I had the piece home, I split it into quarters, sealed the ends and allowed it to dry in a well-ventilated, covered area in the garden. The heartwood of that laburnum is so rich and dark and of such wonderful quality that it would compete with any of the world's great hardwoods. With the apple now sitting in the cup and its central hole horizontal, measure from what would be considered the top curve of the apple - where the stalk comes out - 27mm along the top surface. This will be at about its largest diameter. 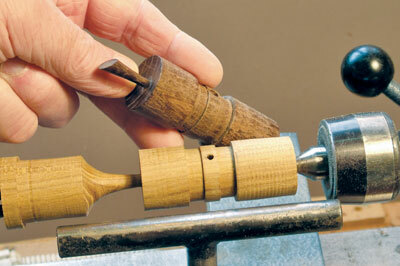 At this point, use a 7.5mm drill to drill vertically down to a depth of 9mm precisely. Make absolutely sure that the drill is aligned so that a vertical hole is drilled (A). Using a 3.5mm drill, drill down through the original hole and into the core to a total of depth of 40mm from the top surface of the apple. This will drill only partially into the core. 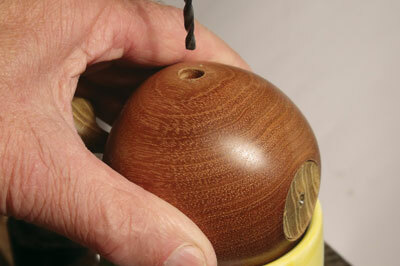 Before removing the apple and core from the mug, mark on the waste wood at the stem, using typist correction fluid to indicate the top surface and the direction from which the drill entered. Remove the apple and core from the mug, then remove the core from the apple. 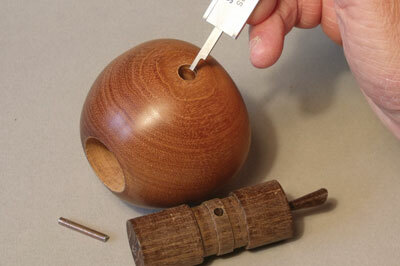 Using the 3.5mm drill, complete the drilled hole through the core. Replace the core in the lathe, between centres, and turn a 6mm wide band around the drilled hole in the core, down to 23mm diameter. On either side of this 6mm band, turn a 6mm wide band down to 21mm diameter. Carefully clean up the core. To complete the core, turn the stalk. At 25mm away from the core body, the stalk should be 6mm diameter, tapering down to 3mm diameter where it joins the core. Using the dot marked in white typist fluid on the waste end of the core as a guide, cut the stalk at an angle so that it slopes down towards the hole in the core (A). The sloping cut will begin 25mm away from the core. If the hole in the core has been drilled slightly off, don't worry. The sloping cut on the stalk will still ensure that the hole in the apple can be precisely lined up with the hole in the core, enabling the puzzle to be solved. Clean up the sloping cut using abrasive paper. Turn a small grub, which will fit into the hole in the apple. It must be 7.5mm diameter and about 15mm long. Shape the last 6mm into a grub's head. Polish the apple body, the end of the grub's head and the top and tail of the core. Do not polish the inside of the core. Cut a 23mm length of 3mm steel, measuring the hole depth to confirm the pin length (A). Small nails are ideal, as they are both cheap and sufficiently robust. Fix the core in place, level with the top and bottom of the apple. Twist the core to make sure that its hole will not line up with the apple hole this time. Drop the pin into the grub hole. Push the grub into place, but do not glue yet. Try the puzzle. It should be possible to raise or lower slightly the core, but not to remove it. The steel pin will drop into the channels above and below the core's grubhole - but not into the drilled hole in the core unless by some fluke - preventing the removal of the core. 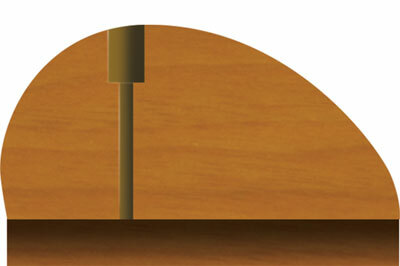 If the core cannot be removed, even though the pin can be heard to drop into the central hole in the core, then the pin is too long and needs to be trimmed. If the core can be removed when the apple is held horizontally with the grub face down, then the pin is not long enough. Cut another which is a fraction longer and try again until successful. When everything works properly, the grub can be glued in place. It can be a fine balance between the pin being exactly the right size, slightly too long or too short, but once you have got it this puzzle is a real brain buster. To remove the core, hold the apple horizontally with the grubhole uppermost and the edges of the core in line with the top and bottom of the apple. Rotate the core until the slope of the stalk points towards the grubhole. 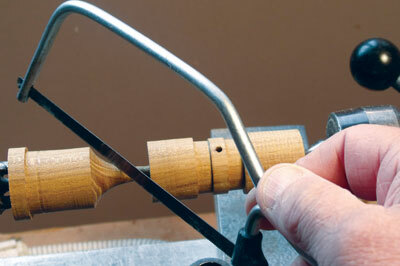 Slowly move the core until the pin drops into the hole at its centre. The core can now be withdrawn. 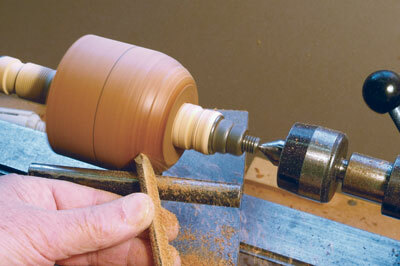 Taken from Woodturning Trickery by David Springett, published by GMC. 1. 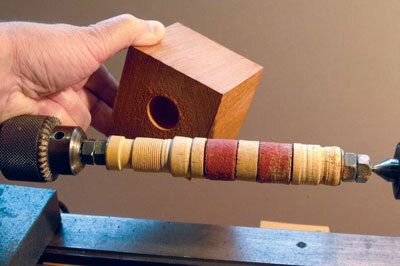 Look closely at how the mandrel is constructed. 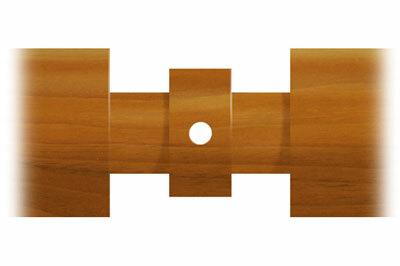 Three wood plugs are interspaced with two rubber bungs or doorstops. 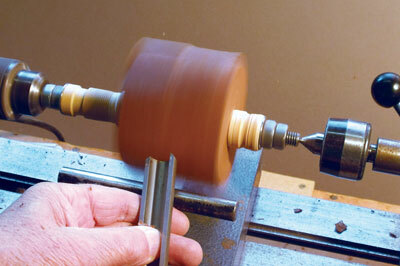 The whole is turned to an accurate 25mm diameter. It helps to freeze the rubber bungs before turning, as this makes them more solid and less liable to run under the cutting edge of the tool. 2. If you wish to make your turned apple more realistic why not paint it? Turning the body and core from a light wood, such as sycamore or maple, provides the perfect surface to accept a paint finish. Using acrylic paints in shades of green will suggest a Granny Smith apple whereas, if one side were painted rosy red shading into leaf green on the other, a classic 'Apple for the teacher' will be created. If you intend to sell the finished apple then maybe a more showy wood with spectacular grain, such as zebrano or quilted maple, would make it more eye catching.